As AI (Artificial Intelligence) becomes ubiquitous, it transforms many aspects of the environment we live in. In cities, AI is opening up a new era of an endlessly reconfigurable environment. Empowered by robust computers and elegant algorithms that can handle massive data sets, cities can make more informed decisions and create feedback loops between humans and the urban environment. It is what we call the raise of UI (urban intelligence). The 2019 Forum on Future Cities, organized by MIT Senseable City Lab and the World Economic Forum's Global Future Council on Cities and Urbanization, will focus on four aspects of the UI transformation: autonomous vehicles, ubiquitous data collection, advanced data analytics, and governing innovation. Panelists include mayors, academics, senior industry leaders and members of civil society to explore such topics from different points of view, highlighting the scientific and technological challenges, the critical collective decisions we as a society will have to make, and the exciting possibilities ahead. Mix and Mingle with SACC-NE! The Swedish-American Chamber of Commerce New England invites you to an informal Mix and Mingle event at Abigail's in Cambridge, MA. Come meet members of the new SACC-NE board and our new Honorary Consul to Boston! Get ready to mingle with the Swedish-American business community! We are looking forward to see you at Abigail's! The Swedish-American Chamber of Commerce - New England is happy to join SWEA in holiday celebration! Come visit SACC-NE at our booth, where we will be raffling out 1 year SACC-NE Professional Memberships to a lucky few! Don’t miss out! The children from the Swedish School of Boston will perform together with Swedish students and au-pairs. SACC-NE is pleased to sponsor McDermott Will & Emery's 7th Annual Life Sciences Dealmaking Symposium! At our Annual Meeting, you will have the unique opportunity to meet and network with our Corporate Members, Directors of the Board, and Professional Members. In this meeting, we will share with you highlights of the 2017 – 2018 year as well as outline the initiatives and programs we have planned for the upcoming year while Corporate Members will be given 5 minutes each to present. RSVPs to attend must be sent to erik.hogberg@saccne.org no later than August 23rd, 2018. We greatly look forward to seeing you there and wish you a fantastic summer! The Nordics Reception - a part of the Nordics Initiative at the 2018 BIO International Convention. Heads up SACC-NE network! We are excited to be able to present SACC-NE's involvement in this year's Nordics Life Science Pavilion at the 2018 BIO International Convention together with organizational partners: Innovation Norway, Business Sweden, SwedenBIO, NLS Days 2018, Nome, Accelerace & Business Region Turku. Our goal is for the Pavilion to act as a home for all of the Nordic companies at BIO 2018 and be a natural meeting space on the show floor for our Nordic friends visiting Boston for the convention. As a complement to the Nordic Pavilion at the BIO convention, we will be hosting an engaging reception in downtown Boston, welcoming Nordic participants and the local Swedish-American executive community. The stage is set for an engaging program with guest opener Nam Pham and speakers Liz Asai and Laura Duerksen scheduled to speak at the event. The Reception will also feature live music in form of opera singer Katie O'Reilly as well as 3D and laser printing demonstrations. As if this wasn't enough, some of our attendees will be able to win special on-the-spot made coasters, commemorating the event. We invite you to an evening of networking with thought leaders and experts in the biotechnology, pharma and life sciences sectors, celebrating our shared Nordic heritage and interest in the Nordics over complimentary food and drinks. Nam Pham. Nam joined the Baker/Polito Administration as the Assistant Secretary of Business Development which oversees the Mass. Office of Business Development, Mass. Office of Travel and Tourism, Mass. Film Office and Mass. Office of International Trade & Investment. Previously Nam was the CEO of Vietnamese American Initiative for Development (VietAID). Liz Asai. Liz is the CEO of 3Derm, a digital health company she co-founded in 2012 based on technology engineered at Yale. 3Derm has developed skin imaging systems paired with machine learning algorithms to triage dermatology concerns. Over the last few years, 3Derm has raised two rounds of funding, conducted three clinical trials, and obtained reimbursement for its dermatological services from several health plans. 3Derm now serves thousands of patients at health systems in the US. Liz holds a B.S. in Biomedical Engineering from Yale University, was named one of LinkedIn's top 10 healthcare professionals under 35, and was featured in Forbes 30 Under 30. Laura Duerksen. Laura is currently the Executive Director of Hacking Medicine Institute, a non-profit educational organization that convenes global healthcare leaders, students, and patients to improve and invent digital health platforms and technology that transforms healthcare by increased access, better outcomes, and lower costs. Laura also currently serves as faculty for the Harvard Medical School Women’s Leadership Course, where she teaches a workshop on healthcare improvement and innovation. Previously, she was Administrative Director of the Dean Center for Tick Borne Illness at Spaulding Rehabilitation Hospital. She has prior experience in hospital administration, including positions held at Massachusetts General Hospital in finance project management and research administration. Ms. Duerksen also has extensive professional experience in nonprofit fundraising, including several years of working at the Boston Symphony Orchestra. Event is free to attend, exclusively for BIO 2018 Attendees and SACC-NE members, but tickets are limited. First come, first served - so act quickly! Join us at CIC Cambridge for an evening celebrating Swedish Woman of the Year winner, innovator of cutting edge battery technology and Swedish success-story: Christina Lampe-Önnerud. Ms. Lampe-Önnerud will tell her and Cadenza Innovation’s incredibly fascinating story while providing unique insight into the transformation that is currently taking place in the energy field. Given how much of the current energy debate is centered around the U.S. and China, Ms. Lampe-Önnerud will introduce us to the global macroeconomic trends and the differences between the two nations in how they approach the sustainable energy question, with China’s advancing gathering more and more spotlight. Join us for what is sure to be an evening to remember! Christina Lampe-Önnerud, PhD, is the founder and CEO of Cadenza Innovation and one of the pre-eminent battery experts in the world. Her company is poised to become a world leader in battery architecture, performance and safety, with a mission to solve big problems through innovation in technology with a ground-breaking battery pack architecture and global Tier 1 partners. Christina has extensive C-suite experience growing and transforming businesses, such as Boston-Power, where she held the position of CEO, and Bridgewater Associates, where she was a part of the senior management, before launching Cadenza in 2012. After having graduated from Uppsala University, Christina went on to do her postdoctoral fellowship at MIT and ended up staying in the Greater Boston area to kickstart her career. Today she is considered a corporate strategist and a highly analytical leader known for fueling strong revenue generation through positive change management. She has extensive experience in US, EU and Asia and serves on the Board of Directors for both NYBEST and Syrah Resources. Parking: Visitor parking is also available at the Kendall St garage and at the Marriott Hotel garage. The Swedish-American Chamber of Commerce - New England is proud to present this event in collaboration with the French-American Chamber of Commerce, New England, the German-American Business Council of Boston & the British-American Business Council of New England. Looking at the world around us, the accelerating pace of technological advancement cannot be denied. Familiar buzzwords like machine learning and big data already sound outmoded. Digital voice assistants have made science fiction a reality in a quarter of US homes. In this accelerating environment of change, businesses can no longer wait for technology to disrupt their business: the imperative is now to disrupt or be disrupted. In a lively and informative presentation, Blu Age Digital Evangelist, Stéphane Mallard, provides a primer on the fundamentals of digital disruption focusing on artificial intelligence, the accelerating pace of technological change, the commoditization of knowledge and expertise (and the impact thereof on business strategy), and how businesses can learn to disrupt like the most disruptive enterprises. This event will be followed by food, drinks and networking! SACC-NE members can enjoy a special member rate for this event. Stéphane Mallard is a French expert in digital transformation known for giving numerous conferences on topics such as artificial intelligence and its influence on human relationships. His promising young career is in full expansion and makes him one of the leaders of his theme. Stéphane learned to code as a teenager. He studied economics in Canada and went on to study political science at Sciences Po, Paris. Stephane started his career in the trading rooms of a major European Bank as a digital evangelist. His role was to communicate the disruptive forces brought about by the digital revolution such as artificial intelligence, blockchain, quantum computing and more. He now works for Blu Age, a tech company that automates legacy systems transformation with a solution that entirely rewrites their code to make them digital-ready. Stephane gives talks throughout the world to raise awareness of the digital revolution and its impacts. GABC and SACC-NE invites you to join us at LabCentral in the heart of Kendall Square’s innovation district, as we explore the significance of the microbiome and its commercial value. What is fact and what is fiction? An impressive set of speakers from Big Pharma and rising new stars from the biotech startup world will talk about their vision for the microbiome. Alex Tucker, PhD is a microbiologist and synthetic biologist interested in efficiently domesticating and manipulating microbial systems. He leads a microbial engineering team focused on enzyme production at Ginkgo Bioworks, a Boston-based synthetic biology company that uses a foundry model to engineer biology at scale. Ginkgo is currently developing more than 40 organisms via commercial partnerships for the production of small molecules, enzymes, and optimized microbes. Prior to Ginkgo, Alex developed gut microbiome engineering technologies as a postdoctoral associate at MIT and subsequently engineered probiotic therapies to treat metabolic disorders at Synlogic. He earned a PhD in microbiology at the University of Georgia and the University of Wisconsin. Bernat Olle, PhD is Chief Executive Officer and Co-founder of ‎Vedanta Biosciences, Inc. which is developing a novel class of therapies based on bacterial consortia that modulate interactions between the human microbiome and the host immune system. He has been a member of the founding teams of several companies of the PureTech portfolio and served as a member of the Board of Directors of Vedanta Biosciences and Follica Biosciences. Arpita Maiti, PhD. As Senior Director, External Science & Innovation (ES&I), Arpita is a member of the external opportunities (discovery to Proof of Concept) search and evaluation team for Inflammation & Immunology, at Pfizer, Inc. She also leads strategy and partnering efforts in the microbiome for Pfizer. ES&I is an externally-focused scientific team of PhDs / MDs, embedded within Pfizer research groups,that identifies late-breaking science forming the basis of innovative therapies, and drives related collaborations that deliver value to Pfizer, its partners, and patients. Deals for which Arpita was responsible include Evotec, Biorap and an investment in AnTolRx. Prior to Pfizer, she was Associate Director of R&D Alliance Design & Management at Vertex Pharmaceuticals. Arpita got her start in biotech at Angiotech Pharmaceuticals, heading the Cell Biology & Drug Screening group. She trained as an immunologist and has a PhD and MSc in Immunology from UBC and a BSc from Trinity College, UofT. In addition to presenting at pharma innovation and microbiome conferences, she co-organized the 12 th World Congress on Inflammation held in 2015, and has served on the board of the Inflammation Research Association in numerous positions, including as its President (2012-14). Philip Strandwitz, PhD is Co-Founder and CEO of Holobiome. He is a specialist in the microbiome, with a focus on the gut-brain-axis. Philip received his PhD in Biology under the guidance of Dr. Kim Lewis at Northeastern University, where he focused on cultivating unique bacteria from the human gut microbiota, as well as studying their ability to modulate neurotransmitters. He has since assembled a broad range of clinical and academic collaborators to further profile the link between the human microbiome and the gut-brain-axis. Philip has presented at numerous conferences, including those held by the New York Academy of Science, Keystone Symposia, and the American Society of Microbiology. He is now CEO as Holobiome, a company he co-founded to translate microbiome science into novel therapeutics to treat diseases of the central and enteric nervous systems. Holobiome announced an early stage research collaboration with Johnson & Johnson Innovation LLC, Johnson & Johnson Consumer Inc. and Janssen Research & Development, LLC in early 2018, and is currently sponsored by Amgen for wet lab space at LabCentral in Cambridge, MA. Azza A. Gadir, PhD is a postdoctoral scientist working on the Immunological mechanisms that underlie food allergy at Harvard University/Boston Childrens’ Hospital. She is specifically focused on understanding the role of the gut microbiome in disease pathogenesis. As part of her research, Azza is co-inventor of a patent for microbial consortia that can prevent and/or cure food allergy and is collaborating with industry partners to accelerate the discovery of microbiome-related immunotherapies for food allergy. In addition, she is serving as a scientific advisor for the startup, Adeo Health Science, a company focused on translating food allergy research into trusted products for parents. Azza received a PhD in immunology from University College London. A 70,000 square-foot facility in the heart of the Kendall Square biotech innovation hub, LabCentral is a first-of-its-kind shared laboratory space designed as a launchpad for high-potential life-sciences and biotech startups. 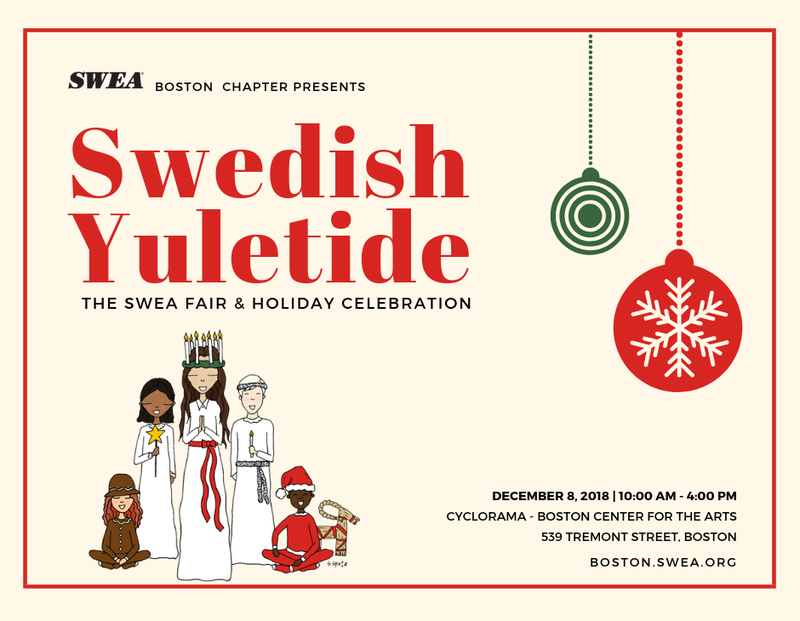 Since 1986, SWEA Boston has hosted Swedish Yuletide to celebrate Christmas and the holiday season. This annual fund raiser attracts thousands of visitors every year and is the largest Scandinavian event in New England. SACC New England will have a booth at the fair- Come and say hi and find out what we are up to! KTH & SACC NE welcome you to an exclusive Swedish Alumni event! The speaker of the night is Professor Max Tegmark of MIT and author of best selling book, "Life 3.0 - Being Human in the Age of Artificial Intelligence"
We have the pleasure of inviting you to join alumni from Swedish universities for an exclusive lecture on what Stephen Hawking calls ’the most important conversation of our time’. Professor Max Tegmark, who’s been called ’the world’s smartest Swede’, will guide you through the challenges and opportunities that will come with being human in the age of artificial intelligence. The lecture will start at 17:30 and will be followed by a networking reception where light refreshments will be offered. The event is free of charge, but for planning purposes, pre-registration is required. Places are allocated on a first come first served basis. FOR SACC NE MEMBERS ONLY. Guest of Honor: Swedish Minister for Higher Education and Research Helene Hellmark Knutsson. Hosted by Professor Sigbritt Karlsson, President KTH Royal Institute of Technology, together with SACC New England. Join us on Saturday, June 17th, to celebrate Midsummer the Swedish way! REGISTER HERE – FREE EARLY BIRD TICKETS FOR SACCNE and SWEA MEMBERS UNTIL 11.59pm EST, May 17th! In keeping with Swedish tradition, we encourage you to bring your own picnic baskets. However, there will be classic Swedish pastries and drinks available for purchase. The Swedish American Chamber of Commerce New England is honored to welcome Professor Bengt Holmström, winner of the Nobel Prize in Economics, to an exclusive fireside chat on Tuesday, April 25th. The event will be hosted at 50 Milk Street in the heart of Downtown Boston from 6.30-8.30 PM. Drinks and appetizers are included in the ticket price. REGISTER HERE - Space is limited so buy your tickets today! This will be a unique opportunity to meet one of the world's foremost professors in economics and mingle with SACC-NE members, government officials and business leaders. We look forward to welcoming you on April 25th. Space is limited – register today! Join the Swedish American Chamber of Commerce New England and kick off the spring season with good friends and new acquaintances at our exclusive event on Thursday March 9th from 6.30pm - 8.30pm. The event will be hosted at Hästens right on Newbury Street in the heart of Boston. The event will include drinks and hors d'oeuvres and members of SACC-NE can enjoy 20% off of all accessories (Pillows, Linens, etc) in the store for that night only. Click here for tickets, early bird sales end Friday March 3rd.